Once you’ve uploaded your assets to Chipmunk, you can organize them into collections, tag them, comment on them, and update them as changes to the files are made—we’ll even keep track of previous versions for you. If the collection for the asset already exists, you can simply drag files into almost any screen inside Chipmunk to start creating assets. 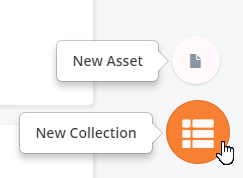 Assets must belong to at least one collection, so if you need to create one, hover over the button and select New Collection. Once you have the collection you'll need, you're ready to drag the files into Chipmunk or select New Asset from the button to browse to the file on your device. If you're not creating the asset as a draft, you can submit now to create the asset(s). 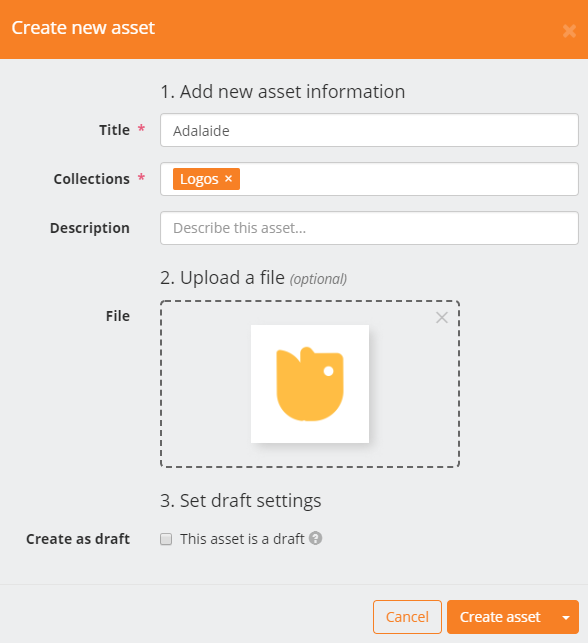 Assets can optionally be created as drafts, requiring approval before they're published, by checking "Create as draft." More on creating a draft and Chipmunk's Draft Workflow. You can also submit a request for an asset. To do so, create a new asset as a draft, leaving the file blank. Once submitted, you can comment on the requested asset to provide specifications for fulfilling it. More on requesting content. Once you've created your asset or draft, you can update any of the information you supplied above as well as adding or removing tags, toggling watched status, and uploading new revisions to the asset from inside of. More on updating assets. You'll find assets you create in the collection(s) you added them to and also using search or by viewing your activity in your feed on Home. You’ll find drafts in the Drafts tab.